Our Golden Horseshoe Golf Club, which was renovated last year, has been rated as one of the top five golf courses in Virginia. It has a PGA Professional staff capable of handling everything from small groups to large tournaments. Our historic area provides countless opportunities for team-building fun, from 18th-century pub crawls and scavenger hunts to ax throwing and musket firing. Adventurous or active individuals can enjoy the nearby ropes course, zip lining, paddleboarding, tennis, and more. Those who prefer a relaxing getaway can take advantage of our full-service spa and our 19 delicious dining options, including the crown jewel of the inn, The Rockefeller Room. 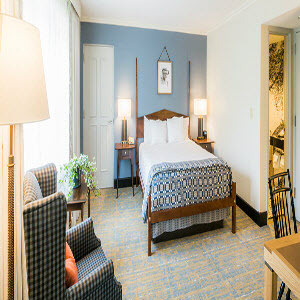 However you prefer to spend your time, Colonial Williamsburg Resorts is well-equipped to ensure that your stay is everything you’d hoped for. Let’s start planning: For more information, Contact us at 800-822-9127 or sales@cwf.org, or visit ColonialWilliamsburgHotels.com.